The World Bank and the US government last week announced major new initiatives to help address data and information gaps about women and girls around the world. 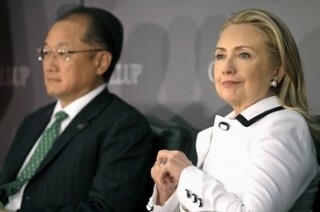 US Secretary of State, Hillary Clinton and the World Bank’s President Jim Yong Kim addressed leaders in business, academia, government and the international community about how to collect and use data to ensure better policies and outcomes for women and girls, and thereby improve entire economies and societies. Clinton announced the creation of a new US Government initiative called “Data 2X” which she said “will develop new curriculum standards to ensure data producers and users train in gender-sensitive techniques. “Working with key data organizations, including the UN, World Bank, OECD, PARIS21, and Gallup, the project will also publish a roadmap on how we together can fill priority gaps in gender-sensitive data as quickly as possible”, she added. The World Bank, in parallel, is launching a new “Gender Data Portal” which will allow visitors to access results from surveys, analytical work and reference materials. Information will cover issues like women and girl’s employment and their access to health, education and decision making. Both Clinton and Jim Kim are unanimous about the reasons for launching these two inititives now. As Clinton said: “we are living in the midst of a data revolution. Massive amounts of information is being shared faster, through more channels, and reaching more people in more places than ever”. Despite this progress, however, data on women and girls is still lacking and this is inevitably weakening planning and decision making processes at all levels. In his speech, Jim Kim discussed information available for women in the agricultrual sector, a hugely important industry for women, especially those in poorer countries. At present, there is no available data for how many women in Sub-Saharan Africa use fertiliser to help grow their vegetables. With this information, donors and governments would know where best to target development funds. Clinton continued the agricultural example by suggesting that “if women farmers had access to the same seeds, equipment and irrigation as men, they could increase their crop yields by 20 to 30%” and feed up to an additional 150 million people. Yet, as she added. “we lack the critical information on women’s land use, property rights and access to seeds and fertiliser”. Data 2X and the World Bank’s Gender Data Portal come at a critical time for advancing the gender equality agenda. The combined weight of these two international agencies is sure to nudge other governments and agencies into addressing the gender data gap that is holding so many women back from advancing within their societies.